If you have trouble finding the proper curling iron, you’ve come to the right place. Today I will present a step-by-step guide on how to choose the best curling iron, and how to use it. I will also add a few tips and tricks on how to curl your hair but first let’s talk about irons. As you probably know or don’t, they all come in different sizes. So, it’s very important to choose the right size. And in order to do that, you should know what type of curls do you prefer. Messy beach curls? Tight ones? Or maybe vintage curls? If you wonder what am I talking about, keep reading because I will break it down for you throughout the article. If you decided what size you want your curling iron to be, hold on because it’s not the only thing you should pay attention to. Type matters too. For example, there’s tourmaline iron, ceramic iron, automatic, tongs, wands, and so on. Now, you’ve probably heard that curling wands are often preferred instead of classic irons. You probably wonder what’s a curling wand? Isn’t it the same as curling iron? YES. And NO. It has the same purpose. But according to many girls, using a curling wand is way better than using the classic curling iron. One of the many differences between these two is the clip. Irons have clips, while wands don’t. Design and price are also different. So, it’s normal to get confused which one to buy and wonder which one will do your curls better. I leave it up to you to decide after you read the features of both curling products. How to pick the right curling iron/wand? What are the features of curling irons? What are the features of curling wands? How to use a curling iron? How to use a curling wand? Curling wand or curling iron? Which one’s better? If you picked the iron over the curling wand, you should know a few things before you buy one. The material is the most important feature you need to pay attention to. Not all irons are made out of the same material. I’ve mentioned this at the very beginning. But now, I will break it down for you. So, I’ve told you that Tourmaline and ceramic irons are the most popular ones. And the safest too. So, if you plan to use your curling iron often, this is the material for you. These irons maintain a steady temperature and release negative ions that eliminate frizz, smoothen your hair and make shiny curls. Titanium irons should be your first choice if you have a hair that’s hard to heat and curl. These irons have negative ions too and will protect your hair while reducing frizz. Metal steam irons are perfect for thin hair that doesn’t hold a curl. These irons release steam. The steam replaces the moisture the metal takes while curling, so it helps your hair to hold curls for a longer period. Gold and chrome barrels heat okay, but they won’t reduce frizz. If you go with a cheaper one, you can seriously damage your hair. In order to help you chose, I created this list of some of the best products out there. One product. Three replaceable barrels. And countless styling options. What more could you possibly ask for in a curling wand? If you look for an easy product to curl your hair with, go for the T3 Whirl Trio. You can get wavy curls, smooth curls or spiral ones. This curling wand is designed to protect your hair and help you style your hair without using other styling tools that will cost you extra money. You can change the barrel and adjust the heat to get the perfect hairstyle. The device has an internal microchip that keeps track on the heat and maintains the temperature. It comes with 5 heat settings, security glove, and barrels you can buy separately if you want to play with your hair. If you want to get that perfect wavy curls or strong curls that will last all day long, the Bio Iconic Curl Expert Pro Curling Iron is for you. It’s perfect for girls with long hair who want to get large curls. The iron has bioceramic heaters, and I’ve mentioned that ceramic irons are one of the best and also safest irons to use. This iron allows your hair to get the heat it needs to create the perfect curls. It was founded by a hair stylist whose goal was to create a safe, and fast curling device that will protect your hair. If you’re looking to find the best wand out there, look no further. LumaBella is the perfect choice for you because it offers enhanced control and keratin conditioning. Meaning, you get more control over styling your hair and create all the styles that pop into your mind. It’s compact and easy to use. You can even travel with it. Put it your suitcase and you’re ready to conquer the world with your perfect hairstyle. It weighs only 1.8 pounds. This wand will help you get the perfect curls thanks to the ultimate performance and the advanced technology. When launching it, the manufacturer’s goal was to provide customers the best curling product. And they accomplished the goal. Xtava is made to make your life easier and help you get your hair in order. It will help you get the perfect curls. No matter if you have thick or light hair, straight or curly, Xtava will tame your hair like no other product out there. It’s designed to protect your hair and fit all hair types. If you decide to get this super tool, you will get 5-in-1 iron with 5 replaceable tourmaline ceramic barrels and a safety glove. Unique. Just like you. Also, it comes with a 2-year warranty. What more could you possibly ask for? If you’re looking for the perfect curling iron with a ceramic rotation mechanism, the Beachwaver is the perfect choice for you. It will help you get those glam and quality waves in just a few minutes. It’s fast and easy to use. Remember not to use it with an adapter and converter because if you do, it invalidates the warranty. The barrel of the iron is one inch in diameter. It has dual rotation and adjustable speed settings. Olaxer Ceramic Wand will give you the perfect hairstyle in a blink of an eye thanks to the special heating technology that maintains the wanted temperature and improves the distribution of heat through your hair. So, if you’re looking for a product that’s easy to use and offers the best curling out there, Relaxer is just perfect for you. It has 5 heat settings, and the best part of the whole product is the switch that goes off automatically after an hour from when you turned it on. It will protect your hair while curling with the ceramically coated technology. And don’t worry because it suits every type of hair. It’s safe and easy to use with a worldwide universal voltage. Lee Stafford Chopstick Styler Curling Wand and Iron is one of the best selling curling products across Britain. It heats up in only 15 seconds and is easy to use. If you decide to give it a try, you will get it with a U.S power plug. It has heated tourmaline barrel that protects your hair from getting damaged. If you don’t have much experience with curling products, don’t forget to use the safety glove that comes along with the wand. It offers salon quality results, 100% money back guarantee and perfect strong curls. When it comes to curling products, size matters. In fact, it’s all that matters because the bigger the barrel, the bigger the curls. So, if you’re into big curls that will make a statement, get Mr. Big Curling Iron. It reduces the frizz and offers gorgeous glam curls like no other product. The name of the product says it all. It comes with an extended barrel that will give you the perfect curls and even make your hairstylist jealous in just seconds. It has controls on the side, and the longest ceramic barrel of all irons and wands out there. It’s perfect for long hair. But it fits all hair types. If you like to try different hairstyles, the Remington T Ceramic Wand is the right choice for you. It offers endless opportunities thanks to the fast heating in only 30 seconds and simple but functional design. The best part of it is that the barrel is coated with actual silk proteins that will protect your hair and prevent frizz. It will give you that bouncy, healthy curls you see on commercials. Remington uses the latest technology and has an 1875-watt motor. Just wrap your hair around it and you’re ready to take over the world with your perfect hairstyle. Plus, it comes with a safety glove and has an automatic shut off mechanism to keep you safe. It comes with a four-year warranty and you can order it in your favorite color. What more could you ask for? Enjoy is one of the most popular, widely used curling iron on the market. It offers that full curls and perfect elegant ringlets. It’s perfect for girls with medium or short hair. To turn it on, hold the power button for only 3 seconds and get the party started. The iron comes with a resistant glove, a guide to help you use it, and two curl clips. It has a ceramic construction that allows you to operate smoothly without pulling your hair. It’s safe and easy to use. It has different heating settings you can choose from. And it has an auto turn off after 30 minutes. It’s suitable for a thick, light and normal hair. You chose the wrong size. I probably didn’t mention but curling devices start at 3/8 of an inch and go up to 2 inches. So, if you have short hair, you should buy a 1-inch iron. If your hair is long and you want to achieve large curls, buy a 1.5 or 1.25 inch in diameter iron/wand. If you want wavy curls, go with a 2-inch iron. Curling too much amount of hair at once. This won’t help you get long-lasting curls. On the contrary, they will disappear because of this “technique”. You use too much heat. This will not only damage your hair but also won’t give you the perfect curls you’re hoping to get. Avoid curling devices without control temperature settings. And don’t leave your hair on the iron for over 15 seconds. You curl your hair in the wrong direction. Style your hair away from the face, toward the back of your head. If you’re styling the right side, curl it toward the right. Same goes for the left side. If you style your left, curl it toward the left. You style your hair while it’s still wet. This damages your hair. Dry it first. 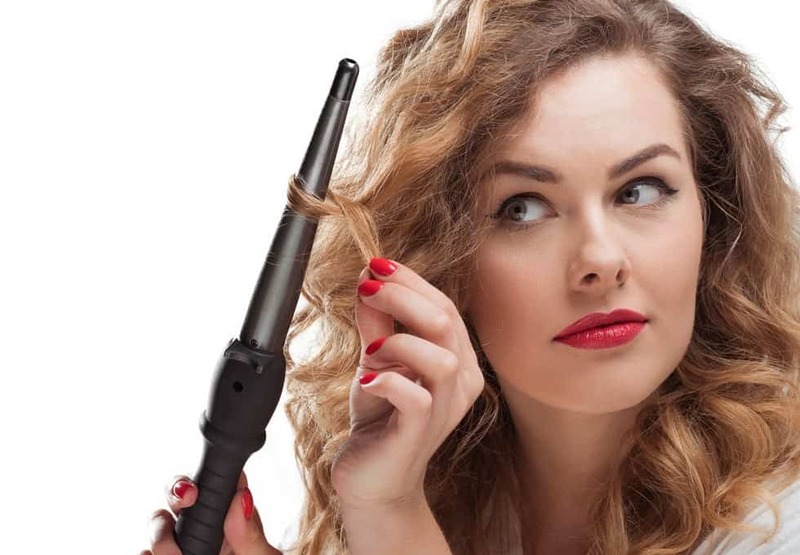 To heat, a curling iron will probably take a few minutes of your precious time. So, the barrel gets heated in order to help you get those long wanted curls. Now, irons have usually one heat setting. You can’t speed up the heating or decrease it. You can only turn off and on the iron. However, if you look better, you can find curling irons that have over one heat setting. They’re usually adjusted with 10 levels you can reach to control the heating. So, it’s up to you to decide if you want a simple iron or this one. Check More Curling Iron for Fine Hair.. This is an important feature you should pay attention to when buying a curling iron because the tightness and size of your perfect curls depend on the size of the barrel. For example, if you want bigger and more voluminous curls, go with the wide barrier. And if you’re into tight more elegant curls, buy a curling iron with a narrow barrel. There are 3 main heating plate materials that are often used, and that’s Tourmaline, Ceramic, and metal. Sometimes, manufacturers use a combination of both Tourmaline and ceramic. Now, you probably assume that the ones that have a ceramic heating plate and Tourmaline heating plate are more expensive. And you’re right. But they’re also more effective and better because they protect your hair while styling. Meaning, they reduce the damage, while the ones with a metal plate are cheaper and protect less. If you’re bored with one type of curls and plan to try all types of curls on the planet, you should pay attention to this feature. So, replaceable barrels represent a special feature of some irons. And I say special because you get to change barrels in different size in order to get different curls whenever you’re tired of your usual hairstyle. It’s like all-in-one iron that will allow you to try various hairstyles thanks to this feature. 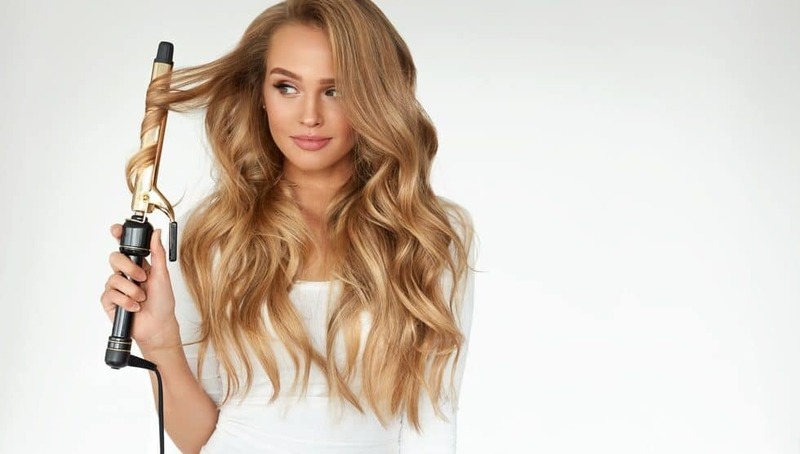 Now, I’ve mentioned the curling wand at the beginning, and you probably can’t wait to finally discover why women went crazy over this device. And why is it better than using a curling iron, as women say. Girls, here are the features of the famous curling wand. Irons take minutes to heat up, while wands heat very fast. In fact, you need to be extra careful when using the wand for the first time because it heats so fast and you can burn yourself. In order to stay completely safe, use a safety glove. Once you start using it regularly, you will learn how to curl your hair without burning yourself. The shape of the barrel in curling wands is sharpened in front of wands. This helps you turn your hair ends into smaller, tighter and more elegant curls. Also, one of the major differences I’ve mentioned before is the holding clip. Irons have it, but wands don’t. There’s no clip to hold your hair firm which allows your curls to come out with no mark and smoother than ever. This is one of the main benefits women get when using a wand. Apparently, if you decide to buy a curling wand instead of iron, your curls will last longer. According to many reviews, curls done with this product stay all day, all night long because of the strong heating. However, let’s check out the main differences. Heat speed: I’ve mentioned before that wands heat way faster than irons. And better and faster heating always gives you better and faster results. Meaning, you’ll get stronger curls. Structure: No clip that will leave your hair with mark with the curling wand, unlike the clip you get when buying an iron. So, it gives you stronger and smoother curls that last all day long. Longevity: If you want that messy beach curls that will stay firm all day and all night long, go with the curling wand. It heats way faster. And will definitely meet all your requirements. Now you know all the important differences between a curling wand and a curling iron, it’s up to you to decide which one to buy and use to get your perfect curls. Will you go with the classic curling iron? Or give the modern curling wand a try? No matter what’s your choice, I have a guide for you on how to use both without burning yourself. And still get the perfect curls that will other girls jealous. Let’s get into it and have fun. If you went with the curling iron, and it’s your first time using one, or you want to improve your technique, here’s everything you need to know about curling your hair. First, you wrap your hair around the iron and let the clip hold it firm. Keep the curling iron between 5 and 10 seconds, or more if you want stronger curls. One of the main benefits of using an iron is that you won’t need a glove to protect your hand as you do with the wand. However, there’s also a disadvantage. And that’s the mark you get because of the clip. But it won’t ruin your looks because it’s almost unnoticeable. Now, I’ve mentioned a hundred times before that a wand comes without a clip which is great. However, it also isn’t because you have to hold your hair with your fingers. If you do this for the first time, I recommend you use a protective glove. Once you put it on, get the handle of the wand with one hand, and hold your hair with the other. Wrap your hair around it and hold for 5 seconds. Then, gently pull away from the wand and wallah. You get your perfect curls in record time. So, if you don’t want to spend much time doing your hair and get better curls, you should definitely go with the curling wand. It’s actually hard to choose which one’s better because it pretty much depends on your taste and the finish look you’re trying to get. However, in my opinion, if you want to get stronger wavy curls that last all day, go with the curling wand. But if you’re attending a wedding, a ceremony or some other event and you want that perfect elegant curls, you should use a curling iron because it’s perfect for getting smaller and more elegant curls. Also, the type of hair you have plays an important role in choosing the curling product that suits you best. For example, if you have thick hair, it can stand the higher heat. But if your hair is thin, you will have to choose a product with a lower temperature to protect your hair. If you want to style large amounts of hair at once, you will need a wand or an iron with a higher temperature. Now, most irons have adjustable settings. This is perfect because you can adjust the heat depending on the thickness of your hair. Keep in mind that you should NEVER use 400 degrees if you’re not a professional because you can seriously damage your hair. Stay between 300 and 340 degrees when curling your hair. If you have thin hair, it’s best you use 175 degrees when styling it. When it comes to curling hair, size matters because the bigger the barrel, the better-looking the curls. So, if you want that wavy curls, chose an iron with a bigger barrel. And if you want the tight elegant curls, go with the smaller one. Twist your hair before you use the iron if you want that tight, skinny curls. It’s the best tip for girls who have wavy hair but what to accomplish that tight curl. Avoid the clamp, if you want to achieve a modern curl. So, you should wrap your hair around and leave an inch at the end. And don’t forget to use a safety glove. If you want the curls to last longer, put hairspray on your hair before curling it. If you start curling your hair at the root, your curls will definitely last longer. Pull your wand gently while it’s warm if you want to get that easy wavy curls. If you want curly hair but don’t have much time, wrap your hair in a ponytail and simply curl it. Once you’re done, put it down and shake your hair a little bit. Never curl too much amount of hair at once if you want your curls to last longer. If you don’t have a curling iron or wand near you but want to get that wavy hair, use a flat iron instead. Wrap your hair around it and release after 15 seconds. If you want looser curls, hold the iron in a vertical position. If you want tighter curls, use it horizontally. What’s your favorite advice or trick from the list? Well, there you go, ladies. 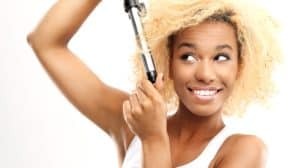 This was my step-by-step guide on how to choose a wand or iron that suits you best, how to curl your hair the right way, how to avoid the common mistakes women make while curling, and I pointed out the main differences between the popular wand and the classic iron, in case you were confused and wondered which one is better. I also presented some of the best products out there. I sincerely hope you will find it useful and I hope you had fun reading it as much as I had creating it.